Hi guys, what a week and it's not over yet! 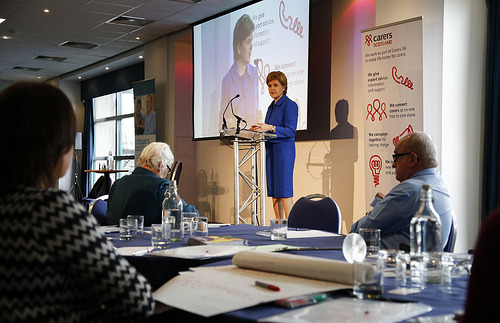 Carers from all over Scotland made their way to Edinburgh for the 4th Carers Parliament. Two Carers from each of the 73 Scottish Parliamentary constituencies attend to make sure as many Carer voices are heard as possible and this year, members of the Welsh Assembly attended too. They want to set-up their own Carers Parliament in Wales so yet again here in Scotland, with our forward thinking and ethos of working together, we have influenced and hopefully helped Carers elsewhere too - I do hope so! Not only to thank Carers for their contribution in our society but to inform on policy and update on the new Carers Bill currently before Parliament. It's good Carers have such a high profile forum, it's taken a long time but now Carers are involved in shaping policy and really helping change things for the better and long may it continue! Remember the community website I was involved with? Well, it's going from strength to strength! Today they had a great exhibition and showcase event over 150 stalls, people, groups and organisations, offering a range of information and supports available all over North Ayrshire and it was busy, busy, busy! I wasn't working at a stall today as Coo wanted to go along and check things out for himself so we mingled, picked up some freebies and learned a thing or two! Carena is not only a website, it's all over facebook and just about anywhere people need some information on services and community supports, offering info on anything from community events to job opportunities and more! It really is a great community resource especially for Carers or anyone who uses social services here in North Ayrshire so...go Carena! Hope you're doing ok where you are.